Take I-70 East to Bridgeport. Take Bridgeport exit to Ohio Route 7 North. Follow Ohio Route 7 North to Steubenville. Take the Washington Street Exit. Follow Washington Street (which becomes Sunset Boulevard) 1.6 miles to the eighth stoplight at Estelle Avenue. Turn right onto Estelle Avenue. Follow it to Broadway Boulevard. The JCESC is on your left. From Carrollton, take ST RT 43 Southwest to Wintersville. Exit ST RT 43 onto US Route 22 in West Limits of Wintersville. Follow US Route 22 East to Steubenville Lovers Lane exit. Follow exit connector to Sunset Boulevard (approximately 1 mile). Turn left onto Sunset Boulevard. Follow Sunset Boulevard 2.5 miles to the ninth working stoplight at Estelle Avenue. Turn left onto Estelle and follow it to Broadway Boulevard. From East Liverpool, take Ohio Route 7 South to Steubenville. Take I-70 East to I-77 North at Cambridge. Take I-77 North for approximately 3 miles to Salt Fork/Cadiz exit (US Route 22). 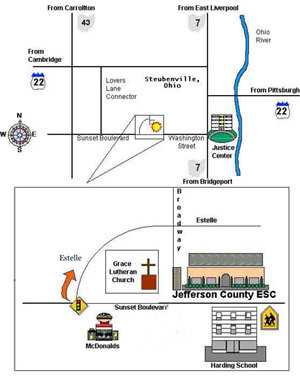 Follow US Route 22 East to Steubenville Lovers Lane exit (approximately 60 miles). Follow US Route 22 West through West Virginia & into Ohio. Exit US Route 22 onto State Route 7 South. Follow State Route 7 to Washington Street.